Before you can truly love someone and enjoy the union, you need to love yourself! 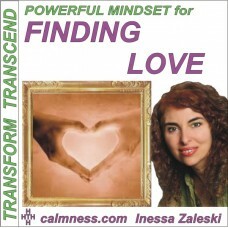 Here you are led through self-discoveries and self-appreciation to find your true love - your own! When you love yourself, you know that you deserve to feel good, you know that you deserve to be happy and you know that you deserve to surround yourself with positive and stimulating people that compliment your personality and life views. Note: The script for this recording was channeled by Inessa during a private session in 1997.